Juhan tekemät korut ovat sirot ja pienehköt, ja myös kauniisti kaareutuvat pallopäiset korviskoukut ovat hänen tekemät. 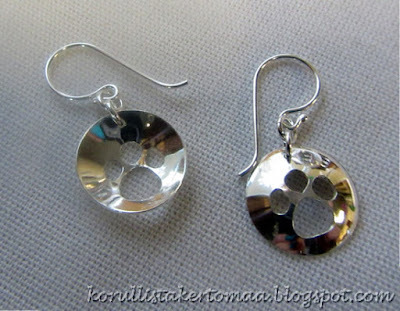 This week we were at a silver jewelry making class in Kurikka, Finland. The class lasted 5 days, but we managed to finish several pieces since we didn't really sleep that much :-D So the next few several weeks I will blog about what we made this time. 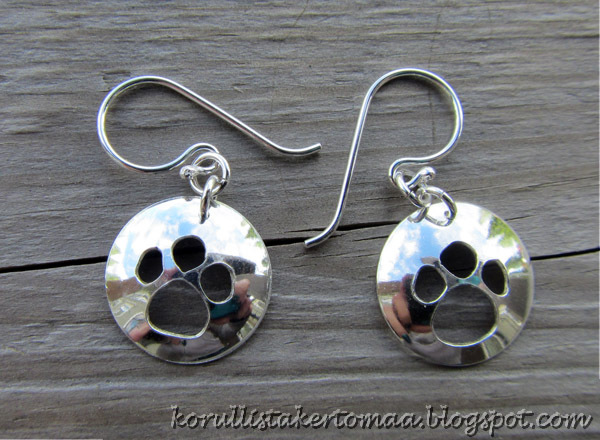 Juha made these paw print earrings for a gift to a girl whose father takes care of our dogs while we are gone. Lovely idea and very elegantly executed with a humourous note! :o) Love them!